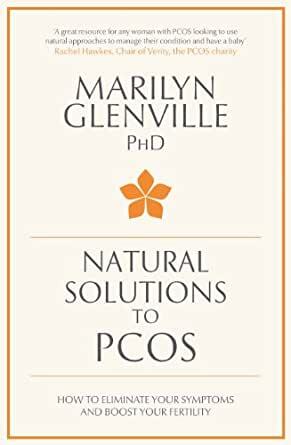 In this reassuring guide, Dr Marilyn Glenville, PhD, offers simple steps to living a symptom-free life with PCOS. Taking a natural approach designed to respect the delicate balance of the female body, she will help you clearly diagnose your condition and tailor a personal plan to manage your symptoms.
." . . an essential read for women living with the disease or for those who suspect they might be." --"Publishers Weekly"
I was looking for a PCOS "bible" and this is it. I've bought several books on PCOS and instead of looking at the whole disease, it's symptoms, and looking at it from a whole-you perspective, they seemed to attack it like a diet book. I was very frustrated with these other books. This one is great. It's smart and gentle in its approach. It helps you understand the why's of the disease and look at eliminating or reducing the symptoms from a gradual, gentle position. It is very thorough and looks at all the aspects of the disease. I'm not trying to get pregnant but just lose some weight and not feel so nuts all the time. 😀 this book isn't just about getting pregnant. It addresses diet, supplements and mindset. 5.0 out of 5 starsVery helpful. My daughter has PCOS, so we checked a few books out of the library to research it. This one was worth buying. I recommend this to anyone I meet with pcos! The book is written to include medical studies which is hard to find on pcos. i learned a lot from her book. It approaches pcos from an integral perspective. The only thing that I think is missing is how to follow up the treatment that she suggests. Too much repetition. The author must've mentioned the same facts over and over in each chapter about a dozen times throughout the book. I didn't find anything useful that I have not already discovered online.